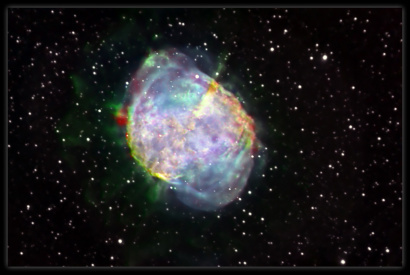 M27 NGC6853, a tone mapped LUM(Ha), SII, Ha, OIII Hubble palette picture, exposure time Ha=5*20min, OIII=3*20min, SII=2*20min. Dark and flat frame subtraction done and astronomik filter used. Taken with Meade LX200ACF 16" in polar mount on wedge, Optec NextGEN WideField 0.5X reducer and SBIG ST-8XME used. Deconvolution and convolution techniques used on the star layer. Adobe photoshop CS4, ImagesPlus and Astroart4.0 programs used for picture processing. Sub-frames taken 15. and 19. Sep-09.